Responding to explosive demand, a flurry of new undergraduate concentrations fosters ethics along with computing and engineering skills. Variations on that theme can be heard around the country as universities race to meet the global demand for engineers and computer scientists who can chart humanity’s course in the age of smart machines. Buoyed by a $34 million donation and construction of a state-of-the-art computational science hall, Milwaukee School of Engineering (MSOE) joined Carnegie Mellon in launching an ethics-infused, AI-focused bachelor’s degree this fall. Other machine-learning powerhouses have carved out specialties. The University of California–San Diego’s Jacobs School of Engineering, for instance, offers an undergraduate AI “cluster” that includes required introductory courses on search and reasoning, statistical approaches, and either computer vision or image processing, while Stanford University and the University of West Florida have AI tracks or concentrations. Small schools also are jumping aboard: Washington’s Bellevue College recently unveiled the state’s first robotics and AI associate’s degree. One of the biggest AI leaps is underway at the Massachusetts Institute of Technology, where a $1 billion College of Computing is poised to transform disciplines from business to urban planning. Behind the surge is the explosive growth of AI—the computer simulation of humanlike abilities to reason, infer, and learn from experience—and growing awareness of both its potential opportunities and risks. AI’s ubiquitous applications will generate $1.2 trillion in business value worldwide in 2018, a 70 percent jump over 2017, estimates Gartner, the research and consulting firm. From autonomous robots and vehicles to voice-activated assistants like Alexa that not only play music but could preserve eavesdropped evidence of a grisly crime to 24/7 medical “chatbots,” AI is likely to become “the most disruptive class of technologies” over the next decade, Gartner says. Meanwhile, at least two of the National Science Foundation’s 10 “Big Ideas” for future investment—human-technology interactions and harnessing data—explicitly involve AI. A machine-learning scientist at a flagship firm in the San Francisco Bay area can earn $273,000, according to the trade publication Synced. With data analytics and deep-learning networks driving advances in every sector, including health care, manufacturing, and transportation, AI graduates face “excellent job prospects,” predicts the Bureau of Labor Statistics. Employment for computer and information research scientists is projected to grow 19 percent from 2016 to 2026. “There’s a fundamental shift going on,” observes MIT professor Saman Amarasinghe, deputy head of electrical engineering and computer science, whose department will be part of the new college. “There’s a realization that computing—and artificial intelligence—are becoming as important as math” and, for researchers, “an integral part of their disciplines.” Case in point: MIT recently hired an AI-savvy civil engineering faculty member to work with computer scientists on intelligent traffic systems. AI has enabled historians to mine old letters and reconstruct Byzantine political networks, while archeologists have detected ancient cities by analyzing satellite images using machine learning algorithms trained on images of known sites. Shahbaz Mogal, a software engineering sophomore at MSOE, was so enamored with AI that he tried to teach himself, only to come away without a “good, concise” notion of what AI professionals do or even a clear definition. By contrast, the AI curriculum has provided an “incredible” introduction that allows him to “directly see the connection between our coursework” and real-world applications. He also got an AI internship that involved using computer-vision technology to solve business problems. “In 10 weeks, I learned more than in a year spent learning on my own,” he marvels. In developing the new major, machine learning within the context of computer science proved “the sweet spot,” recounts Riley, since “it gives students a background in what they’re going to need in the future.” While there are more required statistics and math classes than in a traditional computer science program, little had to be added or watered down. Students apply linear algebra when building machine-learning models to predict, for example, if a borrower is likely to default or how much of a product to make based on last month’s inventory. 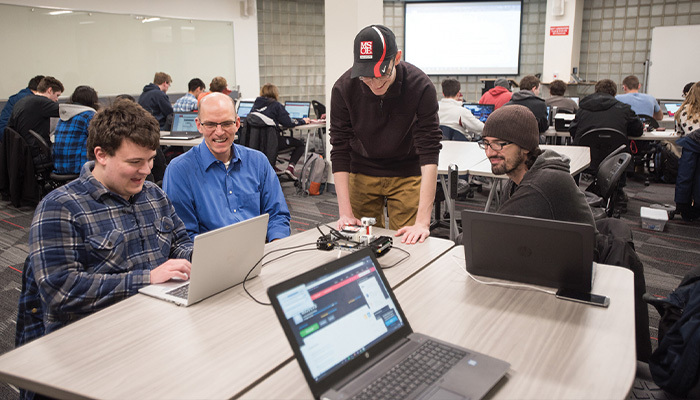 AI also provides a “nice use of calculus,” says R. J. Nowling, an MSOE assistant professor of electrical engineering and computer science, because “we actually use derivatives.” Guest speakers and AI tech talks give students insights on the barriers and ethical considerations that engineers must take into account when implementing these new technologies. Case in point: A talk about the huge autonomous trucks being developed for mining operations included safety issues that gave Nowling’s wife, an engineer who writes safety policies and procedures for industry, fresh insights on how AI-based technologies could affect her own work and the environments she manages. Students get to put theory into practice in a data science practicum that involves working on projects for real clients, “so we have to build in experiences junior year,” explains instructor Jay Urbain, a professor of electrical engineering and computer science and bioinformatics researcher whose own research experience includes mining heart-disease risk factors from clinical texts. UCSD’s AI cluster also aims to build a strong mathematical foundation, particularly in matrices, vectors, and probability—“the bread and butter of data analysis,” says Sanjoy Dasgupta, a professor of computer science and engineering who is involved in the program. But while data science majors need high-level math and computer programming “just to be able to get in the door,” the flexible, six- to eight-course minor offers a mix of computer science and statistics that can be readily applied in music, political science, or any other field. “We tried to design it so it’s accessible to any student on campus,” explains Dasgupta. It’s no surprise that the nation’s first AI major sprouted at Carnegie Mellon. Back in the 1950s, computer science professors Herbert Simon and Allen Newell helped invent the field—though credit for coining the term “artificial intelligence” in 1955 belongs to the computer scientist John McCarthy, who organized the field’s first conference the next year at Dartmouth College. Since then, Carnegie Mellon researchers have incorporated computing, engineering, mathematical operations, and economics to develop breakthrough technologies that range from an interactive website to help users make sense of reams of privacy policies to a self-driving Cadillac SRX that ferried a member of Congress to the Pittsburgh airport. Undergraduate majors have expanded as well. With the majority of the school’s faculty now involved in some facet of AI research, a new major made sense. The resulting curriculum, mostly pooled from existing courses, focuses on how to wrangle huge databases, language, and other complex inputs to make decisions or enhance human capabilities. Along with required courses in computer science, engineering, science, machine learning, and either natural language processing or computer vision, the 30 to 35 undergraduates the degree program will accept each year must complete one ethics elective on AI’s impact on humanity—a campuswide core tenet. A few introductory courses were redesigned. Artificial Intelligence: Representation and Problem Solving, which Fang has been teaching with computer science and Robotics Institute research professor Dave Touretzky this semester, dives deeper into techniques for computers to represent knowledge and make decisions, including mathematical optimization, probability, logic, and game theory. While not a formal prerequisite, linear algebra is used extensively and students are warned they must bone up on the basics. The point, says Touretzky, is to get students comfortable with, and adept at, factoring uncertainty into decision-making programs. Students take snap in-class polls on the probability of rolling a winning dice or plucking a second gold coin from one of three bags. “This is not matrix multiplication; these are equations,” Fang cautioned at one point in her Tuesday afternoon lecture. The AI program also beefed up academic supports. Before diving into calculations, Fang took time to outline the tutoring, extended office hours, and other assists available for the course. She also offers bonus points for spotting any errors in lecture slides, which she helpfully posts the night before. The university’s culture of collaboration, with students from different schools taking classes and working together on projects from measuring Pittsburgh’s pollution to AI art exhibits, lends itself to cross-pollination. Shawn Blanton, a professor of electrical and computer engineering, credits one of his Ph.D. students with spotting the relevance of applying techniques gleaned in a machine-learning course to hardware-testing methods his lab was developing. AI permeates Carnegie Mellon’s engineering program. But AI proved so transforming that Blanton, who develops diagnostic tests for microchips to detect faulty circuits before they get embedded in products, convened his grad students to redesign his course barely 18 months after he’d introduced it. For Mitchell Larson, a computer engineering senior in MSOE’s new major, AI was an easy call. “When I looked for potential jobs, I felt I lacked the tool kit to process data and create a solution,” he recalls. “That’s the real world.” Now, with two internships designing Web applications and aggregating data, he knows he has the essential skills to respond to a manager’s business questions. He also will graduate with a bachelor’s degree that should propel him to the top of the hiring pack—not just for today’s competitive, high-paying jobs but also for tomorrow’s trailblazing endeavors. Game on! Mary Lord is deputy editor of Prism. Image Courtesy of Milwaukee School of Engineering. Design by Francis Igot.